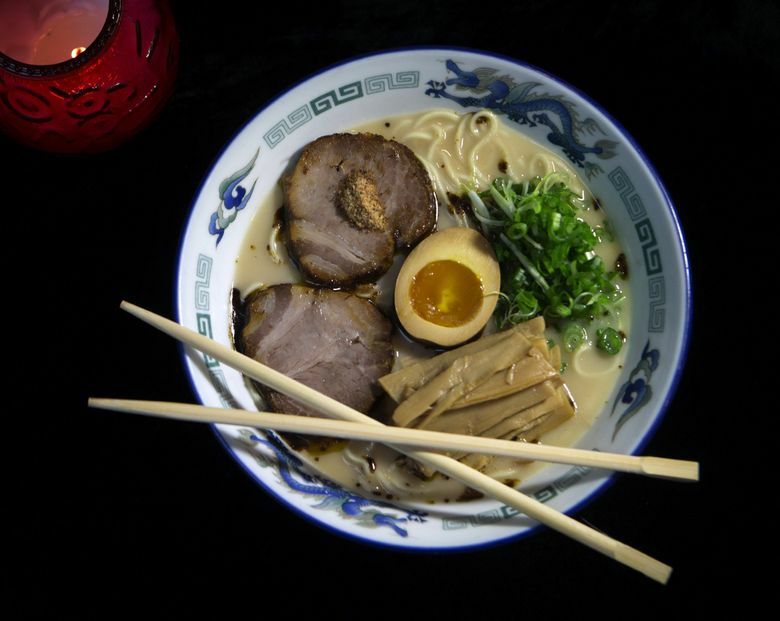 Seattle ramen ranking: Which of Capitol Hill’s 5 new places is best? Five (yes, five!) ramen places opened on Capitol Hill recently. Seattle Times food writers Bethany Jean Clement and Tan Vinh set out to sample them all. Just a few short years ago, Seattle ramen choices were few and far between. Then, suddenly, ramen became A Thing. Whatever you may think of food trends, this one has been to our vast civic benefit, for ramen is great food (especially in the rainy, awful Seattle wintertime). Seattle Times food writers Bethany Jean Clement and Tan Vinh set out to sample all five — yes, five! — new ramen shops within half a mile of each other on Capitol Hill. They now deliver to you this definitive ranking. Just kidding: The ramen you like best is the best ramen, of course. But they hope this might help you find it. Great excitement and long lines met the opening of this place, the first of the Capitol Hill Five, in 2015. (Branches already existed in Bellevue and Northgate; they were all then called Kukai, a name changed the next year because it meant, um, “poop” in Hawaiian. Now West Seattle and Southcenter have a Kizuki, too.) The contemporary, busy interior includes pieces of wood poking into the air, which, from the outside, makes it look like the chairs are up and it’s closed. Three different employees guided us to the garlic tonkotsu shoyu ramen as their specialty, and, like the decor, it had too much going on. The broth contained a strong mishmash of conflicting flavors: porky, vegetal and fishy, all at once. Thickish noodles rated nicely chewy, if not fresh-tasting, while the traditional marinated soft-boiled egg came close to salty-sweet, creamy-rich perfection. But the powerfully odd-tasting broth, along with regrettable sides — greasy karaage, mushy gyoza — lodged this place near the bottom of our list. It was good before the better places came along! — B.J.C. This garlic tonkotsu shoyu ramen had the most fat of all the ramens we sampled. The egg noodles tasted so savory because the fat is sticking to the springy noodles. But the tonkotsu bowl I sampled at its Bellevue branch was better. A line I heard in Tokyo — “the bowl is not in harmony” — applies here. The components are there — some brininess, some porkiness. But the proportions are out of whack, and they clashed. There’s like a WWE battle royal going on in my mouth. — T.V. It’s a sparse menu, only two ramens with a couple of sides, which makes it all the more maddeningly frustrating that it’s not more consistent. When it’s good, Betsutenjin’s Hakata-style ramen has that pronounced porkiness and sweetness, a smooth broth that patrons slurp to the last drop. But then on another night, the soup was thin with none of the creaminess people crave. Same with the gyoza. Sometimes they’re limp and soggy. Other nights, crispy and juicy. — T.V. This branch of a Hong Kong chain nails the unpretentious, homey neighborhood-ramen-spot feeling, with lots of counter seating and extra points for a recent NFL broadcast in Japanese. Tan and I had both really, really liked this place before, but sadly, he’s right to call our recent two visits maddeningly inconsistent. We were shocked by the broth: thin and watery, where prior it’d been rich, creamy and porky (they even have signs boasting that the flavor comes from all pork bones, no milk or MSG). Only marginally better the next time, the broth still had Tan shoveling in all kinds of condiments to bring some life to it. Both times, the thin noodles tasted bland and wan, uninspired. The gyoza’s beautiful sear consoled us the first round, while the second time, they were squishy to the point of mush. We want to love you, Betsutenjin! But you’re making it hard to feel the trust. — B.J.C. Ramen Danbo is as popular in Seattle as it is in Vancouver, with long lines for lunch and dinner. Everyday. The good news: It’s the most efficient of the five ramen spots on Capitol Hill. There’s four servers scattered in every direction to cover about 40 seats, and the tables turn over fast enough — less than 30 minutes — that the wait isn’t long even when the line is. First-timers might want to study the menu while waiting. There’s lots to sort through. Bowls are customized. Pick the ramen style and toppings. Pick which noodles and how firm you want those noodles cooked. Pick the richness of the broth and the level of fattiness and the spiciness. Whew. There shouldn’t be a Subway-style build-your-own approach to ramen. Order it too spicy, it overruns this delicate broth. Order the light broth with no lard and it tastes like low-sodium, canned soup. Danbo should dictate its vision of how that bowl should taste. The question on the menu — how much lard in your ramen — scares the bejesus out of customers here. But fat is a crucial component to ramen. To quote the deity Julia Child, “Fat gives things flavor.” It’s counterintuitive to how we look at fat. In Western cooking, we tend to remove the fat from the broth. In Japan, they add more to it. I like to order a “standard” portion of lard in its tonkotsu. I can taste that fatty sheen, that piquant, porky saltiness on my lips. And the two crucial toppings — egg and chashu — Danbo nails them. The yolk has a dripping, oozy consistency. The pork belly chashu boasts even layers of meat and fat. The gyoza were fried textbook-perfect, a crispy, thick crust to contrast with the chewy texture. And they were so juicy, the drippings squirted out of my mouth. — T.V. The brand-newest Capitol Hill ramen contender, Danbo is currently slammed at almost all hours, and for good reason: The Japanese chain is killing it. Super-prompt service complements a pleasantly simple, upscalish room that feels like a happy cafeteria, the general din occasionally interrupted by moments of quiet when everyone’s slurping at once. Danbo wants you to have it your way, and Tan’s right: The level of choice is overwhelming. I’d recommend just ordering their classic tonkotsu ramen with classic thin noodles, then “standard” straight down the line for the other three (it IS a little nuts!) options. The broth is rich yet refined, the (quite thin) noodles taste super-fresh — oh, and definitely add an ideally creamy-yolked soft-boiled egg. 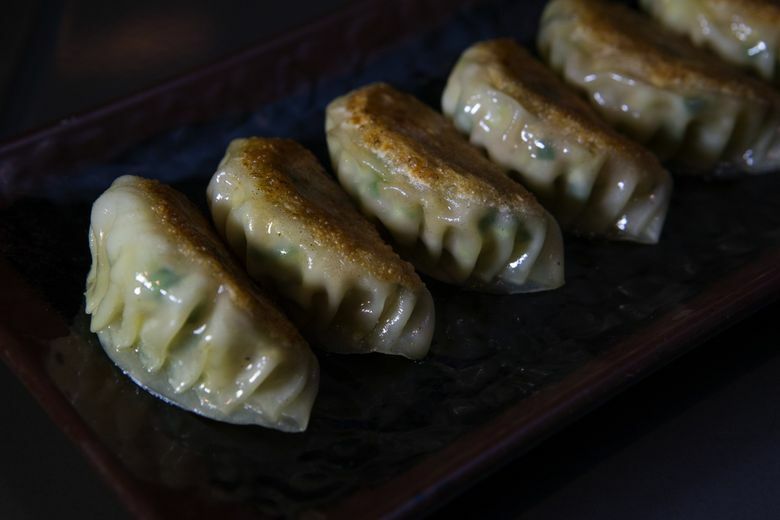 The gyoza, too, were just great: juicy and meaty, with a tender, delicate but elastic wrapper. I’d come here just to eat 100 gyoza and 17 eggs. The fact that this is our second-choice spot makes me feel like there is still goodness in the world, because I’d go here anytime. Like now. — B.J.C. Around here, discerning diners can rattle off names of chefs and even pastry chefs from the top mainstream restaurants, but when it comes to great ramen or pho, most draw a blank. Ooink chef/owner Chong Boon Ooi should be a household name. That 26-hour broth is beautifully crafted. It’s a clean, sweet broth, aromatic with scallions, garlic and ginger. There’s undertones of mackerel, shiitake mushrooms and bonito. This soup had the most depth and flavor, easily the best on Capitol Hill. 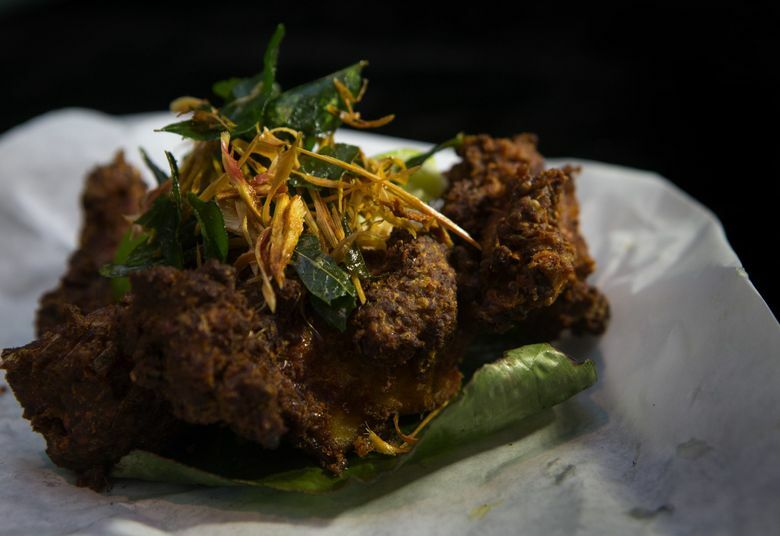 Even if you don’t love the food at Ooink, the dishes are memorable because the tweaks are well-thought out. The spicy chicken wings come coated in a big, crunchy batter, the perfect beer sponge. The gyoza look so appetizing because the specks of green chives and pork stare at you behind translucent, glistening skin. Those morsels were draped in the thinnest wrappers that I saw on our ramen excursions. — T.V. Ooink is a tiny spot: just 24 seats, tucked away upstairs from the QFC at Broadway and Pike. It’s cheerful and bright, and the staff is super-sweet: We watched a server chase someone who’d left their glasses all the way down to the street. 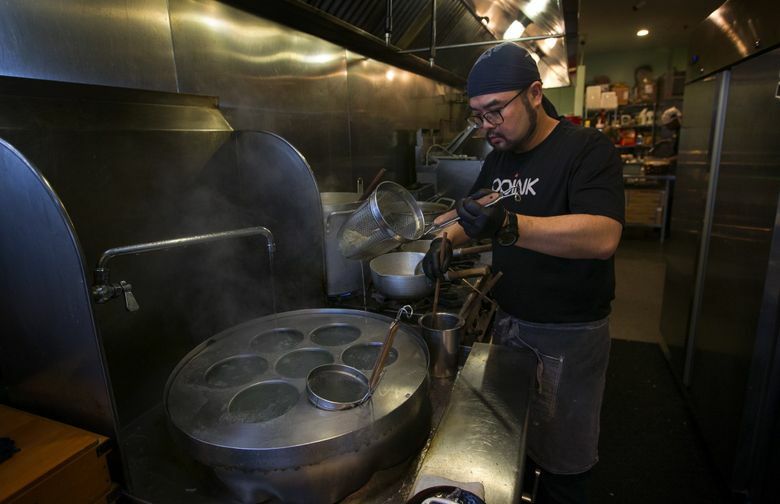 Tan’s right about chef/owner Ooi: He puts a tremendous amount of thought into his ramen-work (and has also cooked at Michelin-starred L’Atelier de Joël Robuchon in Vegas). Talk to him about umami sometime — he’s got secrets. The best way I can describe the broth here is that it’s like coming home, if home was in heaven. Custom-cut Sun Noodles taste fresh and achieve great flavor-cling — and they’re still not good enough for Ooi, who’s talking about losing precious seating for an in-house noodle machine. Pro tip: They don’t advertise it, but they’ll cook your noodles more al dente or softer, to your liking. The personal touch and the sheer ramen-genius make the difference here. I stand by what I said when they opened: Find the best bowl of ramen you’ve ever had at Seattle’s Ooink. (And the gyoza are so good, they might make you want to cry.) — B.J.C.